*This was written on Nov. 16, 2016. The new PBA season is just around the corner and, in a few days’ time, we will finally be treated, once again, to the high-flying and buwis buhay feats of the best basketball players in the country. 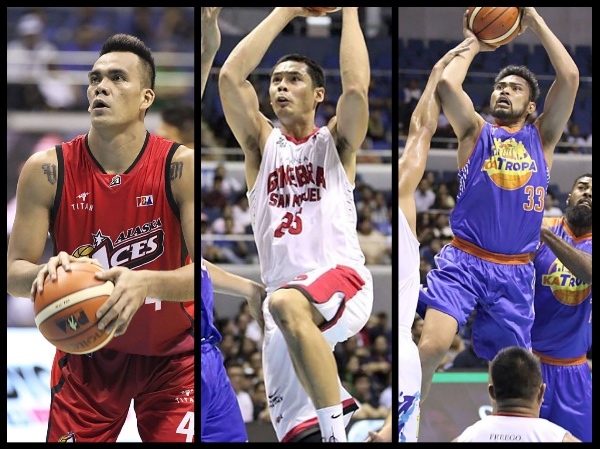 Before the opening ceremonies commence, however, let’s look at some exciting players to watch heading into the 2016-2017 PBA Philippine Cup. In the previous post, I wrote about the Top 5 Small Forwards, but now let’s look at the Top 5 Power Forwards heading into the 2016-2017 season. *This is based on the Player Efficiency ratings as calculated by PBA-Online.net. Stats are accurate as of November 16, 2016. 5. Arwind Santos (SMB) - 12.9ppg, 7.4rpg, 1.8apg, 1.5bpg, 2.1 triples per game. - The 2013 PBA MVP has not really been able to return to stellar levels of production since June Mar Fajardo came into the fold, but the FEU alum still remains one of the most explosive figures in the PBA. His versatility on both ends of the floor makes him a great complement to JMF, and he will continue to play that role as SMB tries to defend their Philippine Cup crown. 4. Aldrech Ramos (STA) - 13.3ppg, 5.7rpg, 1.4 triples per game, 47.5 3pt%, 51.2 FG%. - Ramos has one of the sweetest strokes in the league, and he proved that this past season as he averaged career-highs in scoring and three-point shooting. His entry into the Star roster gives the Hotshots a much-needed boost in wing scoring, and it will be interesting to see how he plays alongside Marc Pingris up front. 3. Ranidel De Ocampo (TNT) - 12.6ppg, 6.2rpg, 2.6apg, 1.6 triples per game, 34.8 3pt%, 47.1 FG%. - RDO is turning 35 in a few weeks, and his age is starting to show. His scoring and three-point shooting dipped significantly last season compared to 2014-2015, and I wouldn’t be surprised in the least if he gives way even more for the development of young buck Troy Rosario. Still, given his leadership and experience, RDO should remain one of the cornerstones of TNT this coming season. 2. Vic Manuel (ALA) - 13.7ppg, 6.2rpg, 53.5 FG%. - Manuel is a classic PBA power forward. At 6’4, he has good size to play the 4, and he has all the time-tested tools to be an effective bruiser around the basket. He isn’t called the “Muscle Man” for nothing, after all. The main worry about Manuel, however, is his health. He played 16 less games last season than he did in 2014-2015, and the Aces certainly hope he can be around much more constantly as they try to return to the upper tier of the league. 1. Japeth Aguilar (GIN) - 13.7ppg, 7.0rpg, 1.4apg, 1.7bpg, 49.9 FG%. - The 6’9 Aguilar was the biggest reason Ginebra hardly felt the pangs of Greg Slaughter’s prolonged absence late last season. Japeth was at his darned best for the Gin Kings as they waltzed all the way to the 2016 Govs’ Cup title. He has shown a heightened level of aggressiveness and court awareness that has made him, hands down, the best power forward currently plying his trade in the PBA. If he continues to play at a very high level for Ginebra, they should contend for a title again this season. Cliff Hodge (MER) - 11.6ppg, 7.7rpg, 2.0apg, 41.4 FG%. Arthur Dela Cruz (BLA) - 11.8ppg, 4.7rpg, 2.2apg, 1.8spg, 50.2 FG%. Marc Pingris (STA) - 9.2ppg, 6.8rpg, 2.1apg, 51.8 FG%.